Ceiling speakers could be an incredible addition to your home audio system. They sound great, take up no extra space and become almost invisible once installed. The other good thing about the ceiling speakers is that they can be fitted in any room. For somebody who likes to tune in to their most loved track amid a shower can fit them effortlessly in their bathroom, and for someone who likes to enjoy music while cooking, can install them in the Kitchen. Today, we will walk you through reviews of the 10 best ceiling speakers, which we believe could be a great choice for anyone. We will also discuss all the things that a buyer needs to consider before going for any ceiling speakers, including the size, sound quality, safety, and other few things. We believe that this in-depth review post will surely help you in choosing a great pair of ceiling speakers for your home. Polk Audio has an exceptional presence in the market when it comes to speakers. The company is a trusted manufacturer of Audio products and is notable for designing home and automobile speakers. None the less whatever it produces is unquestionably the best. RC80i is a 2-way 8 Inch ceiling speaker that delivers very rich and balanced stereo sound. This is surely a perfect speaker for every household. Frequency response ranges from 35Hz to 20Khz. Equipped with mineral-filled polymer 8-inches composite cone with dynamic balance. Made up of moisture resistant and durable element. Comes with single 1-inch dynamic balance metalized soft dome tweeter along with 15-degree Swivel mount. In-box accessories include 2 cardboard templates, 2 grilles, a pair of RC80i speakers, paint masks, and an easy to follow user manual. Though the speakers are made up of a robust and moisture resistant element, that doesn’t mean that they are waterproof. You can not throw waters at them and expect them to work fine. They are just moisture resistant, which makes them suitable for bathrooms, kitchens, and saunas. The speakers feature durable complex driver baskets that keep the moving part in rigid alignment and wide dispersion technology that allows the surround sound to reach each and every corner of the room, doesn’t matter at what corner the ceiling speakers are installed. The RC80i speakers also come along with a tweeter level switch that allows you to alter the highs for your room acoustics. The tweeter is very well matched to the overall design on the speakers so that it also remains unnoticed and disappeared. After reviewing so many ceiling speakers we could say that the installation process for few of them could be complicated, but surprisingly the same for these ceiling mount speakers is dead easy. If you have installed some other ceiling speakers in your home before, then the process would be same, and for those doing it for the first time, the user manual that comes along would guide you through every minute step. Talking about the sound quality, it is really impressive and you are hardly going to face any issue with them. The sound gets filled in the room quite nicely and the speakers can get pretty loud without any distortion. Perfect high and mids with some good amount of bass. We would suggest you use them for a few days and then evaluate the overall performance. Some audio devices need a little break-in period to showcase their full potential. Talking about the price point, these might not be the cheapest pair of speakers on the market, but they are not too expensive either. The speakers truly deliver complete value for money. Robust and Moisture resistant design. Great Surround sound that reaches every corner of the room. Equipped with a 1-inch metalized soft dome tweeter. RC80i is the perfect ceiling speaker with hardly any drawbacks. The moisture proof material makes it good to be used in Saunas, bathroom and kitchens, the places where most of the people prefer to listen to music. The price is affordable, and until and unless you are obsessed with some other specific brands, you must go with this. You can see RC60i as the younger sibling of RC80i. It is not much different in terms of specifications, other than the size, which is comparatively 1.5-inch smaller than the RC80i. 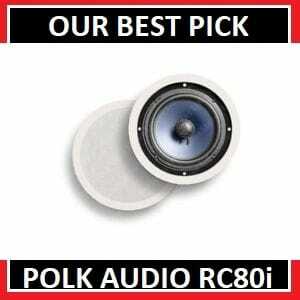 Polk Audio RC60i is a clean modern-design ceiling speaker that would cost you a few dollars less than the RC80i. Like it’s successors, this also comes in white color, and are not prone to moisture damage, which makes them perfectly suitable for bathrooms, kitchens, and saunas. Frequency response ranges from between 40Hz to 20Khz. Comes with one 6.5 inches dynamic balance polymer composite cone with rubber surrounding. Robust and moisture proof construction. 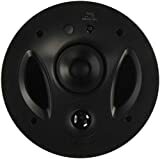 The manufacturer has added single 0.75-inch soft dome tweeter inside ball and socket swivel mount. In-Box content includes a pair of RC6oi ceiling speakers, paint mask, and user manual guide. The speaker scores A plus for the design and sound system. The sound is loud and you can enjoy the music from any corner of your room, even if the speakers are installed on the extreme corner from your position. The bass is pretty good and adds a really good flavor to the listening experience. The midrange is clear and the Highs are solid. The bass is undoubtedly great, but if you want to get the best of bass, try using them a Home theater system. The sound is not just loud, but it’s also distortion free, which means even at the highest volume level, the sound will not crank up. The RC60i is designed keeping audiophiles in mind. The speakers are said to pair with a variety of other speakers, which make them good for mixing and matching purpose. The installation process for these ceiling speakers is no different than the RC8oi and we were able to install them easily and quickly. But still, if you are not sure on how to install them, then hire an expert to do the job. We believe some of the people might not like drilling holes all over the ceiling. The tweeter added to the RC60i allows the speakers to be used in large rooms with complete surround in every corner. We installed them in our large hall and felt no difference in hearing from any of the corners. The dimension for each speaker is 6.5 inches, which is large enough but pretty smaller than RC8oi. Like RC8oi they also disappear well in the ceiling architecture and are hard to notice after installation. Additionally, you can paint the grill to match the decor. The RC60i is made of robust materials, that gives it a really long lifespan. Along with durability, the material used is also moisture resistant, which means you get to install the speakers in your bathroom, kitchen or saunas, without worrying about them getting damaged. The only thing that is not perfect is the build quality of the grill. It’s not very weak, but it’s not strong either. Take extra precautions while taking it off and putting back, a fall could cause a dent on it. It might not be a big issue, but you must prevent it from falling. Tweeter distributes the sound to every corner equally and perfectly. Equipped with a metalized soft dome tweeter. Moisture proof body for use in bathrooms and saunas. Easy to install for the first timers. Polk is a really trusted brand when it comes to speakers, and RC60i from them are the perfect ceiling speakers in terms of both the quality and the price you pay for it. The overall look and sound quality is exceptional and we are sure that you would love them. Yamaha is one of the greatest manufacturers of speakers in the world. From smallest to the largest speakers, Yamaha manufactures everything. Yamaha Ns-IW280 is a 6.5-inches speaker as similar to Polk RC60i, but the difference between them is that this one is a 3-way ceiling speaker system while the one from Polk is the 2-way speaker system. Rest comparing the prices for the speakers at our second and third position, there is hardly any difference there. Yamaha NS-IW280CHW speaker can be bought in a pair, set of 4 and set of 6, depending upon the need. Dual 3/4 inch dome tweeter accompanied by soundmax technology. The maximum power input of 100 watts. Swivel tweeter that helps in a wide dispersion. 6.5 inches polypropylene mica cone woofers. No distortion even at loud sounds. These are the probably the most awesome pair of ceiling speakers from Yamaha that are also very affordable. With an adequate amount of power, you will get a really impressive surround sound with bright highs and solid lows. The bass is precise, nether it’s too much nor too less, its exactly what ceiling speakers should have. But, In case you feel like you need more punchy bass, you can connect them to a sub-woofer. We got to hear complaints from some of the users that the bass is so so and not too great. Well, the speakers come with 6.5 inches driver, and that’s the best they can deliver. If you are a bass lover and fell like the bass is not enough for you, you can simply go for a sub-woofer and optimize the bass as per your needs. Though the manufacturer hasn’t said anything about them being moisture resistant, we personally used them in saunas and bathroom, and we also know many people who have been using them for years in bathrooms, kitchens, and saunas, and have faced absolutely no issues, which means they could be installed in those places. The installation process for the Yamaha speakers is no different than the Polk audio. It’s quite simple and can be easily done by following the steps in the user manual. Each speaker comes with a template to cut out the ceiling, which makes it extremely easy for you to do everything by yourself. Talking about the design of the speakers, it’s simple and comes in white color. Once installed, as similar to other speakers, they become almost invisible. Looking at the picture of the speaker you might think that they do not come with a paintable grill. So, we here want to confirm that the Speaker does come with a white colored grill, that can be painted to match any decor. Comes with sound max technology. 3/4 inch swivel tweeter for wide dispersion. Comes at a great price point. Yamaha NS-IW280CWH is one of the best 3-way ceiling speaker systems you will ever see. The sound quality is extremely clear and bass is precise. The installation is process is quite easy and we are sure users would be able to install them by themselves. Overall a very good product from yamaha at an affordable price point. 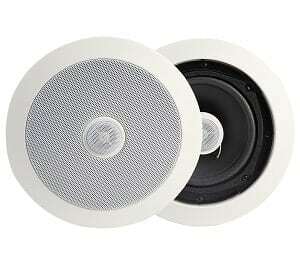 Micca M-8C is a 2-way ceiling speakers that comes in different sizes. The one we are going to talk about today is a 8-inch speaker. Like the other speakers mentioned above, Mica M-8C do not come in a pair. So, if you want to want to buy a pair, make sure you add 2 speakers to the cart. The Micca M-8C is a great sounding speaker with an excellent bass output. Comes with a 1 inch soft dome tweeter. Clear sound signature with robust bass. Available in both In-wall and In-ceiling options. Easily blends in any decor. Micca M-8C is designed with carefully selected components to provide you exceptional value for money. The combination of 8-inch poly woofer and a 1-inch tweeter dome provides extreme flexibility in terms of audio configuration. This makes it suitable for users with different tastes in music. The build quality of the speaker is pretty robust which would last for years without any issues. The white grill that comes along is paintable, so in case you want the speaker to be of the same color as your decor, you can do that with the help of paint mask that comes along in the package. The best thing about the Mica M-8C is the Poly-mica woofer. It not only delivers clear and loud vocals, but it is also capable of delivering solid bass, that allows you to use the ceiling speakers without any subwoofers. The Pivoting dome tweeter along with poly-mica woofer deliver extremely clear and detailed sound. Pivoting design means that the tweeter can be used to configure soundstage as per the preference. This perfect integration between the woofer and tweeter is achieved by a 6db crossover network. The installation is very easy with the template that comes along. Just mark and cut the hole with a drywall knife, use the built-in mounting tabs and you are all done. If you had ceiling speakers in the past, then the installation process would be more easy, since the installation holes would be already in place. The Speakers is also suitable for installation in a bathroom and saunas. The cone is built of plastic and the surrounding is made of rubber, that helps in keeping it safe from splashes and moisture. Talking about the most important thing that is sound quality. The sound first of all is very clear. You can clearly hear the vocals at even loud levels. The excellent sound is then supported by the robust bass. The bass might not be as much you get with a sub-woofer, but it is enough to not make you feel like you need a sub-woofer. Comes with 8-inch poly woofer and 1-inch tweeter. Detailed sound reproduction with robust bass. Available in different sizes and types. Suitable for installation in bathrooom, kitchens, saunas. Mica M-8C is a very powerful competitor to other brands both in terms of specifications and price. It’s hard to get a 8 inch ceiling speaker at such a price point that sounds good, looks great and most importantly comes with a robust bass. Addiotionaly, The Mica M-8C is available in both both in-wall and in-ceiling variant. 82C is a 8 inch 2 way ceiling speaker that comes with poly mica woofer and rubber edges. This 82C Silver ticket is one of the most popular and affordable speakers on this list. The speaker is available in two sizes: 8 inches and 6.5 inches with different variation including ceiling, in-wall and angled in-wall. The price point is as similar to other speakers from Polk and Yamaha, which makes it a really tough competition for the big brands. Comes with Poly-mica cone woofer with rubber edges. Comes with a 30oz magnet that delivers clear and detailed sound. Also comes with a 20mm silk dome tweeter. Frequency response: 20Hz – 20,000Hz. Power handling capacity: 60 -120 watts. Solid and moisture resistant construction. Comes in various sizes and types. 82C is a versatile 2-way ceiling speaker that works great with all the stereo system and high-end home theater systems. The 8-inch poly mics help in delivering clear stereo sound that can be enjoyed from any corner of the room. Combine it with a 20mm silk dome tweeter and you are looking at something really awesome. The installation process is, as usual, easy and can be done by anyone by following the simple user manual that comes along. Talking about the places where the speakers can be installed, it can be installed in the room and even bathrooms and saunas since it is made up of moisture resistant material. The one thing that keeps the 82C speakers ahead of the competitor is the fitted-in high-end magnet tuned with the voice coil. This helps in attaining loud surround sounds, which are not noisy and harsh. The speaker maintains the excellent smoothness and clarity even at high volume levels. The look and feel of the speaker are no different than any other ceiling speaker in the market. The accent trip around the edges makes them really disappear in the ceiling, which is a very important thing for any ceiling speakers. The speaker in itself is pretty solid. The material behind the grill is enough to keep the dust away. Tweeter build quality is also pretty solid. The speakers come with everything that’s needed for installation. Even if you are a beginner, the chances are you will not face any difficulty installing them. The templates that come along makes it easy for you to cut the right size holes and fit the speakers within. Talking about the sound quality in detail, the speaker produces a full range surround sound that could be felt from any corner of the room. Highs, mids, and Lows are clear, and the bass is pretty tight. You can definitely fell the punchy sound while watching movies. For the best possible experience, you can hook them up to a subwoofer. 20mm solid built silk dome tweeter. Comes with poly0mica woofer with a rubber edge. Comes with a 30oz magnet. Built with solid, moisture resistant material. As said earlier, there is absolutely nothing wrong about the 82C ceiling speakers. They look good, are build up of really sturdy materials, come with a 20mm tweeter for sound stage configuration, and above all come with a 30oz magnet that deliver excellent sound. Pure resonance VA8 is the most advanced ceiling speaker on this list. It is basically an array/combination of 3 speakers that acts as one speaker. The Resonance VCA8 is ideally built for conference rooms, churches or any place that involves a gathering of people. The ABS housing of the speaker can be painted to any color to match the decor. 8 ohms independence and 120 watts output wattage. Combination of 3 full range drivers. Each speaker measures 6.5 inches in size. It might be ideally suited for large halls and conference rooms, but if you want to install it in your home, you will still get a great audio experience. The combination of speakers simultaneously emit great surround sound, that is not just loud, but it is also very clear. The speakers it itself is very lightweight but comes packed with some really powerful tech. The high and mids are extremely accurate and the low end is fair looking at the size of the speakers. We have tested them in big halls with high ceilings and the sound was surrounding really well. This excellent sound dispersion is achieved with high-performance drivers working together to create an omnidirectional. The installation process is easy and no different than any other ceiling speaker. Simply cut the ceiling, fix the speaker, attach the wires and you are good to go. 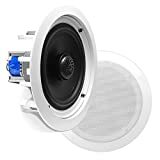 The hole for this ceiling speaker would be quite larger than any other speaker mentioned in this list, but that wouldn’t affect the installation process at all. The speaker comes with fire retardant ABS housing that can be easily painted to match the color of decor or ceiling. The housing is also very well designed and looks really great when installed. since it comes in white color, it will suit any color, so painting is basically optional. The price of the speaker is not cheap, which is very obvious since you are buying an array of speakers. Also also, the speakers are serving a big hall, not a small room. Ideal for large halls, conference rooms, churches etc. Great dispersion of sound across hall. 3-6.5 inches drivers fixed together. If you are looking to get spakers for a classroom, conference hall or any place that involves a gatherng of people, then you must buy this speaker. They are diealy built for such scenarios and works great. The stereo sorround sound from them is pretty awesome and the overall build quality is nice as well. 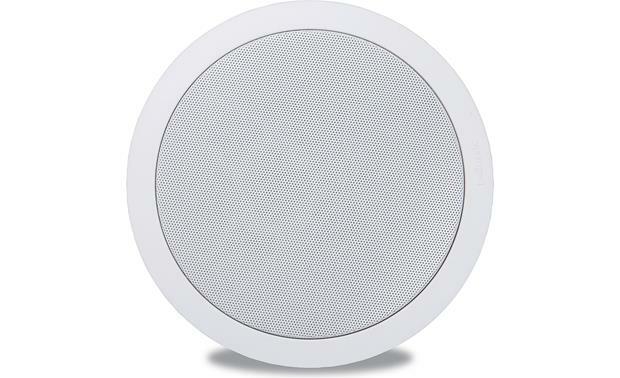 This speaker from Yamaha is a crossover type 2-way 8-inch ceiling speaker that has a very slim profile design. The 8-inch speaker is available in 4 different variants including 90 watts, 110 watts, 120 watts, and 140 watts output power. The speaker in itself is a high performing ceiling speaker with excellent low and mids sound reproduction. Slim profile design makes the speaker hard to notice. 8 inches poly-mica cone woofer. Paintable grill to match the decor. Moisture and dust resistant seal back cover. Yamaha is a very trusted and popular brand when it comes to producing audio devices. We have already seen an excellent budget oriented ceiling speaker from them, and this one is slightly better than that in terms of overall design. The ceiling speaker comes with 8-inch poly mica cone woofer and fluid-cooled soft-dome tweeter. The tweeter swivels so that the user can attain the highest frequency. This could be really helpful since every user has a different audio preference. The 8 inches Yamaha original double layer cone helps in delivering natural and clear sound. Along with it comes unique ridges shaped aluminum cap that eliminates frequency peaks in mids and highs, producing even and smooth sound. The one thing that we absolutely love about these speakers is that the grill is magnetic, which makes it very easy for the users to remove it and put it back. We are not saying that removing and putting back on non-magnetic grills is a pain, but sometimes it could be. The body of the ceiling speaker is paintable, which means it can be easily painted with any color to match the decor. The body is also moisture and dust resistant, that allows you to install the speaker in the bathroom, kitchen or even sauna. The installation process is very simple. You just have to take out the templates from the package and drill the holes according to the size of the template, and then fix the speakers. The sound quality overall is really good with some real punchy bass. The sound is clear and well surrounded. You can efficiently hear the audio in every corner of the room. As soon as you will play the music on them you will feel the bass. There would be some thump. A very sleek design that looks really good. Comes with a silk dome tweeter. Paintable grill and moisture resistant body. Natural and smooth stereo sound. Yamaha NSIC800WH is undoubtedly a very powerful speaker. The sound quality is very natural and smooth with no frequency bumps. It is giving head to head comptetion to all the 2-way ceiling speaker in this this list, so we would advice you to compare wisely. 82S2c is a 2 channel 2-way ceiling speaker that comes with a 30oz magnet which helps in delivering clear distortion free sound. 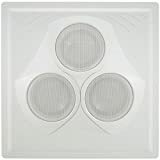 Silver ticket offers 82S2c ceiling speaker in various sizes and types including 5.25 inches, 6.5 inches, 8 inches, 2 channel, 2 way, angles in-ceiling and in-ceiling speaker. This speaker comes with 2x20mm silk dome tweeter that helps in producing silk-smooth sound at any desired frequency. 8 inch poly-cone woofer with rubber edge. Frequency response: 40Hz – 20,000Hz. Robust and moisture resistant construction. Power handling capacity: 60 watts normal and 120-watt peak. Also comes with a 30oz magnet. Silver ticket ceiling speakers are something that could be fully trusted. We also have 82C from the company on this list, that delivers a great audio experience. The speakers might not be the cheapest ones that you will ever find, but, they are definitely one of the best ceiling speakers you will ever see. The 82S2C is a mid-budget ceiling speaker that comes with an 8-inch poly cone woofer, which performs exceptionally and brings music to life. The 2x20mm done tweeter that comes along is quite different from any other ceiling speaker. It is extra lightweight and produces amazing highs. The high-energy magnet tuned with voice coil brings out the true efficiency of this ceiling speaker. This means that even at high volume levels, the sound would be pleasant. It maintains excellent sound clarity at all volume levels. The installation process for the speaker is similar to any other 8-inch speaker. Each package comes with cut-out templates and paints masks, which makes it very easy for the user to install the speaker themselves. Anyways, you always have the option to hire someone to do the installation for you. The body of the speaker is made up of high-quality materials and is also moisture and dust resistant, which means it is completely safe to install the speaker in the bathroom, kitchens, and saunas. The grill is of white color which could be painted to match the color of decor. If you compare them to some of the other brand’s speakers on this list, then you will hardly find any difference. They are equally good in terms of both the sound quality and build quality. 2x20mm silk dome tweeter that produces amazing highs. Dust and moisture resistant build. Distortion free sounds even at high volumes. 82Sc is a great mid-budget ceiling speaker that performs great even at high-volumes. The 2x20mm works great for tuning and woud come handly for all of the users. We assure you that this speaker would be a really good addition to your home audio system. Pyle ceiling speaker is probably one of the cheapest ceiling speakers on the market. It available in two different sizes: 6.5 inches and 8 inches and is usually sold in a pair. Pyle ceiling speaker is a 2-way mount speaker that has 2 ways for installation: In-wall installation and ceiling installation. Comes with a 70V transformer. 65Hz – 22KHz frequency response. Comes with a 1-inch titanium dome tweeter. Power handling capacity: 250 Watts. The speaker that we are reviewing today is 6.5 inches in size, equipped with 1-inch high-temperature voice coil. It is a great ceiling speaker that in combination with 70V transformer delivers clear stereo surround sound that could be enjoyed at any corner of the room. The most special thing about this speaker is its power handling capacity. Till now, all the speakers that we saw had the maximum power handling capacity of 100 watts or 120 watts in best cases. In the case of Pyle pro, the maximum power handling capacity is 250 watts, which is insane. The speakers can be sued both in-wall or ceiling speakers. In case you change your mind in near future, you can switch the speakers between your wall and ceiling. Integrated amplifier switch and wiring connection make it easy to set up. Talking about the sound quality, it’s fine. You might not get the best experience ever, but they do the job very well. The high could have been little detailed and bass could have been lower, but again, looking at what you are paying, it’s great. Overall the speaker provides good value for money. The installation is easy and even a new user can install it with the help of cut-out template that comes in the package. We recommend not to hire someone to do that as it would cost you a good amount of money, but, if you can afford it, you can go for that route too. The one thing that you might face a problem with is removing the grill and putting it back on. Removing the grill might come off an easy task, but putting it back one would be a painful and a little time-consuming task. We would advise everyone to read the manual carefully. 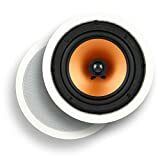 Could be used as both in-wall or ceiling speakers. Can handle power up to 250 watts. One of the cheapest ceiling speakers available. Inbuilt 70V transofrmer for better performance. Putting grill on/off could be a pain. Sound quality could have been better. Sound might not be the best, but it’s good, and since they are so cheap, we can not not complain about that. It also has some unique features like 70V inbuilt tranformer and the power handling capacity of upto 250 watts, that would create some loud sound. 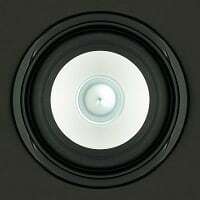 Polk Audio 70RT is a high end ceiling speaker, for which you would have to pay an extra amount as comared to other ceiling speaker. As compared to other Polk ceiling speakers, this speaker features some exclusive technology. One of the things that’s extraordinary in this speaker is the bass. It comes with dual-band bass ports that help in delivering deep bass. Built with exclusive thin sheer-grill. Dual band bass ports for excellent bass. Comes with perfect fit templates. 70RT excels at everything including build quality, sound quality, bass quality, and the installation process. The sound quality is definitely better than any low budget ceiling speakers. Also, according to us, they are the best-looking ceiling speakers on this list. Installation is really simple with the templates that come along. Additionally, the speaker in itself is very invisible once installed in the ceiling. the build quality of the speaker is really sturdy, they will hardly get any damage with time and would definitely last for several years without any issues. The speaker is usually black in color that comes while grill that could be painted to any color to match the decor. The 70-RT is powered by power port technology and dynamic balance and come with 3/4″ dome tweeter, 7-inch subwoofer and 2.5″mid-range driver for a personalized and smooth sound experience. Usually, ceiling speakers sound bloomy, but Polk 70RT has a really pleasant mid-range. This is because most of the other ceiling speakers are 2-way speakers and the 70RT is a 3-way ceiling speaker. An extra driver takes care of the mid-range so that it does not have to compromise mid-range for bass enhancement. One thing that is extraordinary with 70RT is the overall bass. It is not a huge bass, just a precise tight bass. This excellent bass response is achieved by dual-band ports. You might not feel that extraordinary bass in a large room, but in small rooms, you will surely feel the punch. Unique design and great build quality. 3 drivers for uncompromised mid-range. Dual band bass ports for improved bass. Price point is lightly higher than other speakers. Polk 70RT is a brilliant 3-way in-ceiling speaker system from Polk that produces an amazing sound with precise bass. The look of the speaker is quite unique and build quality is excellent as well. Yes, it is an expensive speaker, but it is completely worth. In-ceiling speakers have become a popular choice among users who are trying to build a smart home for themselves. With an increase in popularity, there has been an increment in the number of brands in the market that offer in-ceiling speakers. Some of the major brands include Polk, Yamaha, Jbl, Bose etc. Apart from different brands, ceiling speakers also come in various sizes and colors, which makes it even more confusing for the customer to make a choice. So with so many brands in the market, which one you should go for? In this Buyer’s guide, we will give an answer to some of the general questions about ceiling speakers and will also walk you through the complete guide on how to choose a great ceiling speaker. Why do I need a Ceiling Speaker? You must be thinking ” Why shouldn’t I go for a normal speaker and put it in my room? “. Well, firstly, a normal speaker will take quite a space in your room, while the ceiling speakers, on the other hand, takes up no extra space and still provide a good sound experience. It will save you some space. If you have kids at home, who have a tendency to knock off things, which is common with most of the kids, this will prevent them from knocking off the speakers. There is no chance for you to trip over the cables as there are no visible cables in-ceiling speakers. They provide better surround sound, which will allow you to enjoy movies and watching sports in a better way. We agree that installing an in-ceiling speaker would take some time and it is a fairly complicated task, but trust us, the end results are worthwhile. The ceiling speakers start from being 4 inches or smaller to up to 8 inches. The most popular size is 6.5 inches, which is suitable for most of the places. The size of the ceiling speaker depends on your room size, for example: If your room is small, a small size speaker would work fine. However, if your room is a little spacious, you will need a larger speaker. Usually, 6.5 inches of ceiling speaker fit best to everyone’s needs. Best for smaller rooms where the decor is the main concern. They get along in the best way with the ceiling and get really invisible once installed. However, they are not the best sounding ceiling speakers you will ever see. Middle and lower frequencies would be quite weak resulting in overall average sound experience. 6.5 inches speakers are probably the best size of ceiling speakers you can every own. They provide great surround sound, precise bass and are driven by good drivers. They are considered the best value for money speakers while being not too large or small. 8-inch ceiling speakers are one of the largest sizes you will see in the market. They are good for large halls and provide a better sound and bass experience. Though being a little expensive, they could be a cost-effective choice. What shape should I go for? There is no technical difference between the round ceiling speakers and square/rectangle shaped ceiling speakers. Both can provide great stereo surround sound and are easy to install. You just need to take into account the style of the room and then decide what shape would go well with the ceiling and will become as invisible as possible. How should I install the speakers? Once you get a ceiling speaker, you need to think about the installation. Do you want to install it yourself or you would like to call an expert to do the installation for you? Installation, in general, is quite easy and guides for that are available all across youtube. Moreover, the cost of expert installation is usually very expensive. In general, installation requires drilling a hole in the ceiling with the help of the template that comes along. Place the speaker in the people and fix it with the speaker attachments that come along n the package. The connection the cables from the speaker to the sound equipment is a little tricky. However, if you already have the wiring going beneath the ceiling for speakers, then you are all set. Where’s the best place to Install them? The best practice would be to install the ceiling speakers at equal distance apart from each wall. 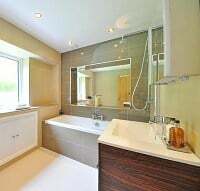 We understand that some of the rooms might be awkwardly shaped. In that case, we recommend going for a ceiling speaker with the angleable tweeter to direct the sound to the most important areas. This might not be at the top of this list, but this should be sure at the top of any consumer’s list. In terms of sound, there are two things you should be mainly concerned about: Frequency response and watts. The frequency response is the range of sound that the speaker can produce. A ceiling must have 50hz to 20,000Hz of frequency response to provide a good listening experience. Talking about the watts, it refers to the highest amount of power that a speaker can handle. Higher power handling capacity, better the sound experience. Can I install it in the bathroom? Most of the modern speakers on the market are moisture resistant. which means you can install them in the bathroom, kitchen, and saunas without any issues. Usually, the manufacturer of the speaker mentions in the specifications that if the speaker is moisture resistant or not. In case you can not find that written in the description, just confirm it with the seller. Please don’t assume every speaker to be moisture resistant. How many ceiling speakers do I need per room? For smaller rooms a single pair of speakers would do the job. But, if you got a large room, you should install two pairs of speakers to get a balanced surround sound in every corner. For kitchens and Bathroom, a single speaker (not pair) would be a good fit. How far apart should ceiling speakers be? The surround speakers should be placed about the same distance as the front and right speakers. In numbers, the ideal spacing should be around 18-24 inches from the adjacent ceiling or wall. Ceiling speakers by default are not wireless, but, they can surely be converted into that by using the wireless kit that is sold separately by the same company or third party. This would make using the speakers super easy. What type is better, In-ceiling or In-wall speakers? Technically In-wall speakers have an edge over the ceiling speakers, since they are pushing in the sound directly in your ears, while the ceiling speakers push the sound over the head, hence the in-wall speakers sound better. 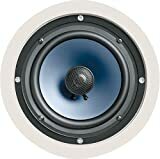 How much does ceiling speaker cost? A single unit start from around $30 and can go a lot higher depending upon the brand and quality. You can get an excellent pair of ceiling speakers for $100-$150. “A professional”person could take up to several hundred dollars for the installation, which we do not recommend unless you are super busy. Anyone can install the ceiling speakers easily with the help of the templates that come along. Can I paint my ceiling speakers to match the decor? Grills of most of the ceiling speakers, if not all, could be easily painted to match the decor, that’s super easy and safe. Top 10 Bluetooth Headphones for listening to Music. Best Dashboard Cameras for your Vehicles. Cheapest Speaker on our list.